• Eligibility. No purchase necessary to enter or win. This promotion is open only to legal U.S. residents of the following counties in the station’s viewing area: Parmer, Castro, Swisher, Briscoe, Hall, Bailey, Lamb, Hale, Floyd, Motley, Cottle, Cochran, Hockley, Lubbock, Crosby, Dickens, King, Yoakum, Terry, Lynn, Garza, Kent, Gaines, Dawson, Borden, and Scurry, who are 18 years of age or older at the time of entry, who are 18 years of age or older at the time of entry. 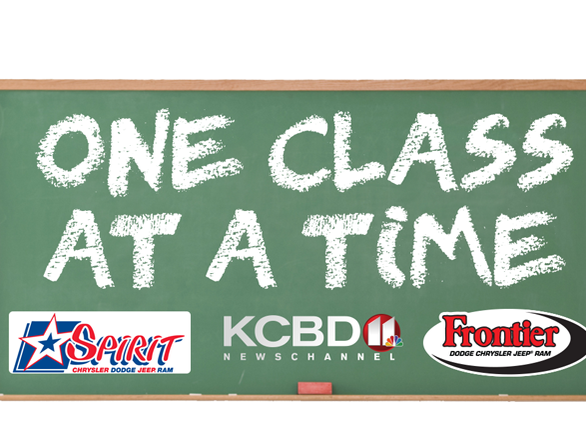 Employees and immediate family members of employees of Raycom Media, Inc., KCBD-TV, the other Sponsor(s), and their respective parent companies, affiliates, subsidiaries, agents, and their advertising and production agencies are not eligible to participate in this promotion. Only one entry per individual will be accepted, and multiple entries will be disqualified. • How to Enter. There is one way to enter this promotion. Beginning at 12:00 am 3/19/2019, individuals can log on to www.kcbd.com and enter the entry form on the contest tab with their prediction of how much rain will fall in Lubbock from 3/19/2019 through 7/1/2019. All entries become the property of Sponsor(s), and Sponsor(s) reserve(s) the right to use any information submitted by entrants. Entrants are only allowed to enter one time. By entering this promotion, entrant agrees that KCBD-TV and the other Sponsor(s) of this promotion may provide entrant with promotional materials and that KCBD-TV may release entrant’s personally identifiable registration information, including but not limited to the entrant’s contact information, email address, and all information contained in the entrant’s social media profile, to the other Sponsor(s) for that purpose. KCBD-TV is not responsible for the use of entrant’s personally identifiable information by the other Sponsor(s) or the Social Media Sites (as defined below). • Ownership and Publicity Rights. By submitting an entry in any form, entrant represents and warrants that he/she owns the copyrights and moral rights to any and all artistic or commercial works contained in his/her entry, including any images, logos, music, videos, and/or literary or written content (even if such works are in the background). In exchange for the opportunity to participate in this promotion, entrant grants Sponsor(s) the perpetual, royalty-free, worldwide, and irrevocable right, but not the obligation, to use, edit, alter, copy, reproduce, disclose, display, publish, prepare derivative works from, perform, distribute, exhibit, broadcast, stream, embed, or otherwise exploit the entry, in whole or in part, whether in connection with the promotion or not, in any form, media or technology, now known or hereafter developed, including, without limitation, broadcast and cable television, radio, mobile transmission and the Internet, for any purpose whatsoever, including, but not limited to, advertising, promotion, entertainment and commercial purposes, without any payment to, or further authorization by, the entrant. Entrant represents and warrants that he/she has the right to grant all of the rights in this paragraph to the Sponsor(s), and that he/she has secured all third party rights, including but not limited to copyrights, trademark, and privacy rights contained within his/her entry. Entrant represents and warrants that the entry is original and that all factual statements contained in it are true and correct and not exaggerated. If at any time Sponsor(s) receive a request to remove any entry from Sponsor(s) broadcast, website, blog, twitter account, message board, podcast, social media profile, mobile application, or other media claiming entrant’s failure to secure or possess any of the rights contained herein, Sponsor(s) reserve(s) the right to remove the submission and eliminate entrant from further consideration in this promotion. If any entry: (1) contains material that is violent, pornographic, obscene, illegal, inappropriate, defamatory, or racially or morally offensive; (2) does not comply with these rules; or (3) does not meet Sponsor(s) standards for any reason whatsoever, Sponsor(s) reserve the right to reject the entry as ineligible for submission. Please see our website’s Terms of Service for terms and conditions on content submissions. • Prize(s). 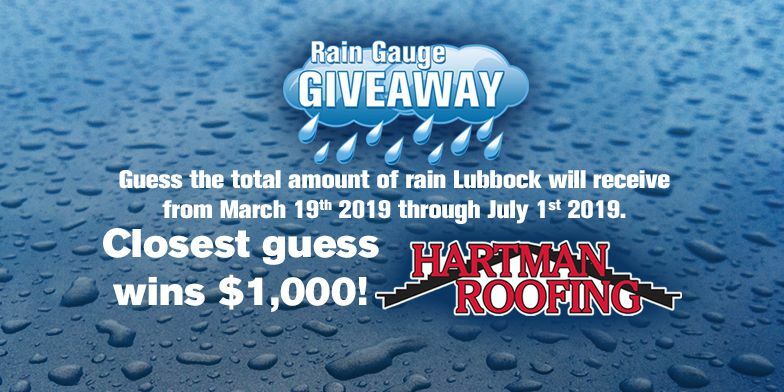 The entrant that guesses closest to how much rain will fall in Lubbock from March 19th through July 1st will win a $1,000 gift card from Hartman Roofing. 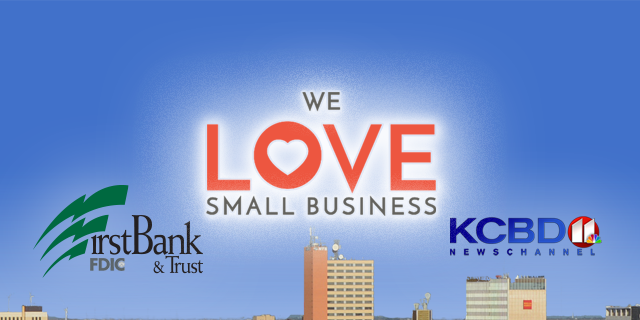 Daily winners will be drawn from April 3rd – July 1st to win a KCBD First Alert Rain Gauge. • How the Prizes are Awarded. The Grand Prize winner will be determined by who can guess the closest to the amount of rainfall in Lubbock from 3/19/2019 through 7/1/2019. The daily First Alert Rain Gauge winners will be drawn at random from the entries submitted online. • Odds of Winning. The odds of winning depend on the number of eligible entries received. • Conditions of Acceptance of Prize. A driver’s license, appropriate picture identification, or other proof that entrant is the owner of an account or profile is required to claim a prize. The winner(s) will be required to execute and return an affidavit of eligibility, a publicity release, and a liability release within 15 days of selection notification. Failing compliance with any of these conditions, the winner will forfeit his/her selection and Sponsor(s) shall have the right but not the obligation to select another winner(s) based on the original judging criteria. A winner must take possession of his or her grand prize by 7/7/2019 or the prize will be forfeited. Daily First Alert Rain Gauge winners must pick up their rain gauge by 8/1/2019 or the prize will be forfeited. Each winner agrees to the use of his or her name and likeness in publicity without any additional compensation, except where prohibited by law. 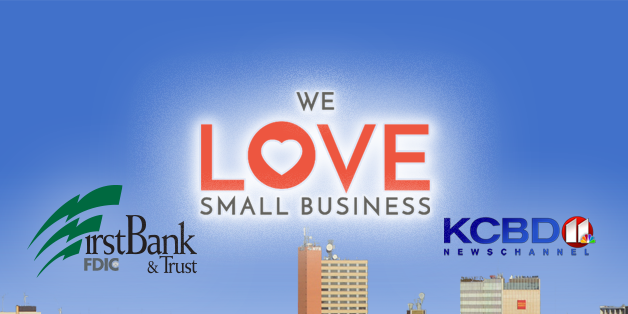 By entering this promotion, each winner acknowledges that KCBD-TV, and all other sponsors and venues, have the right to publicize and broadcast each winner’s name, voice, likeness, the fact that he or she won, and all matters incidental thereto, including any information that is publicly available on the winner’s social media profile or account, or to which the winner gave Sponsor(s) permission to access, either directly or indirectly, through the Social Media Sites or any related application. • Limitation on Liability. By entering this promotion, each entrant forever discharges and releases Sponsor(s), its/their parent companies, subsidiaries, affiliates, and their respective directors, officers, employees, and agents from any and all liability, claims, causes of action, suits, and demands of any kind arising from or in connection with the promotion, including, without limitation, defamation, invasion of privacy, misappropriation of likeness, false light, copyright or trademark infringement, responsibility for property damage, loss of life, or personal injury or death resulting from or in connection with participating in the promotion or from or in connection with use or receipt of the prize(s), however caused. By entering this promotion, entrant fully and completely releases the Social Media Sites from any liability associated with or related to participation in this promotion. • Sponsor’s Reservation of Rights. These official rules are subject to modification by KCBD-TV. In the event of a dispute, all decisions made by KCBD-TV are final and binding. Sponsor(s) reserve(s) the right, in its/their sole discretion, to disqualify any person who tampers with the entry process or the operation of Sponsor’s/Sponsors’ web site(s), or who otherwise acts in violation of these official rules. Sponsor(s) further reserve(s) the right, in its/their sole discretion, to cancel, terminate, or modify this promotion if, for any reason, the promotion is not capable of completion as planned (including, but not limited to, for the following reasons: infection by computer virus, technical corruption, force majeure, or non-authorized human intervention that compromises or affects the administration, fairness, integrity, security, or proper conduct of the promotion). • List of Winners. For a list of winners, send a self-addressed stamped envelope to 5600 Avenue A, Lubbock, TX 79404.